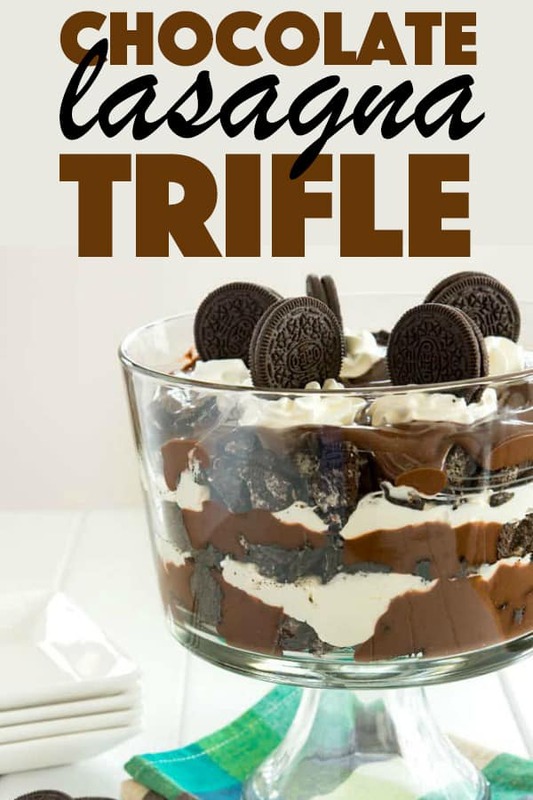 Chocolate Lasagna Trifle- a no-bake dessert ready in 15 minutes! 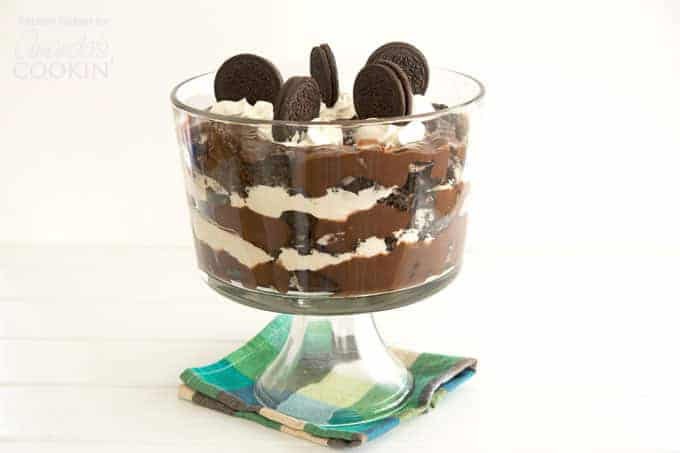 Chocolate Lasagna Trifle – everyone’s favorite dessert lasagna gets layered into a gorgeous trifle with Oreos, cream cheese and chocolate pudding. 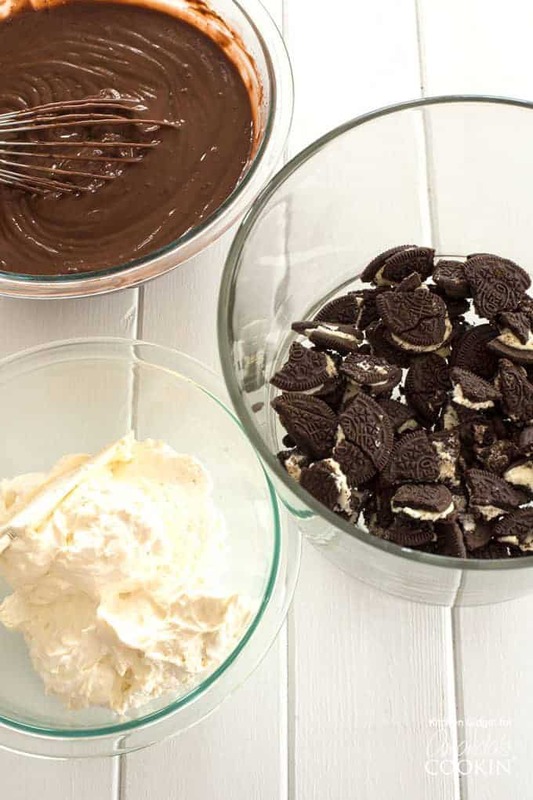 Stun your guests with this no-bake dessert that’s ready in less than 15 minutes! I’m a huge fan of chocolate lasagna. 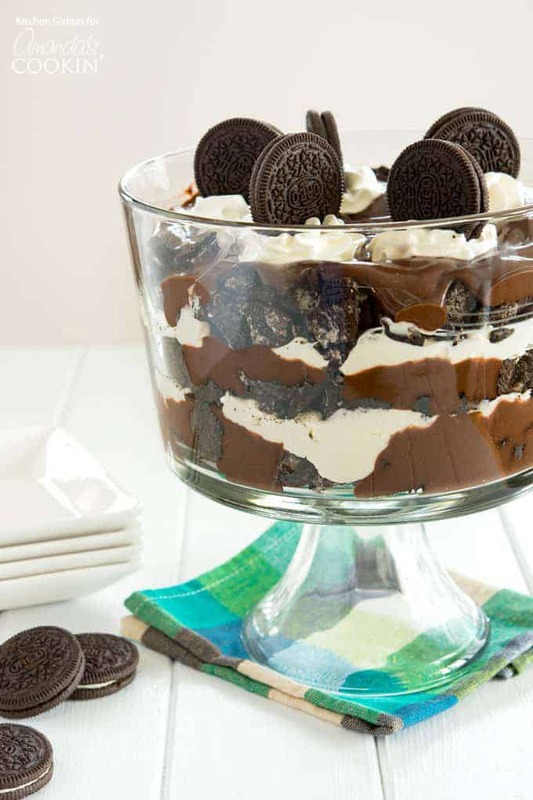 You know the one – also goes by dessert lasagna, chocolate lush or Oreo delight. In my family, we make a vanilla pudding version that we call Oreo Cake. Whatever you call it, this no-bake layered pudding dessert is amazing! 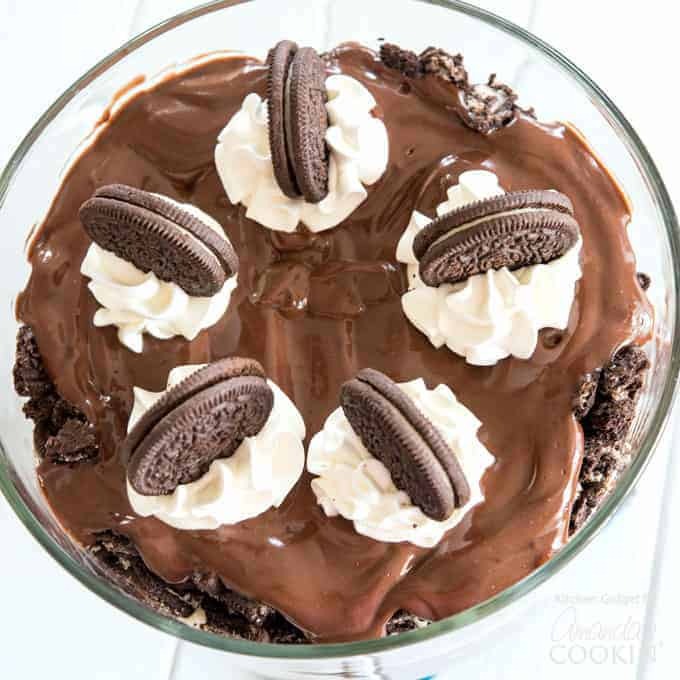 The traditional chocolate version features an Oreo crust, followed by a layer of sweetened cream cheese, then chocolate pudding and topped off with cool whip. This dessert is easy enough to serve after a family dinner, special enough for parties and celebrations, and one of those desserts that always disappear at potlucks. 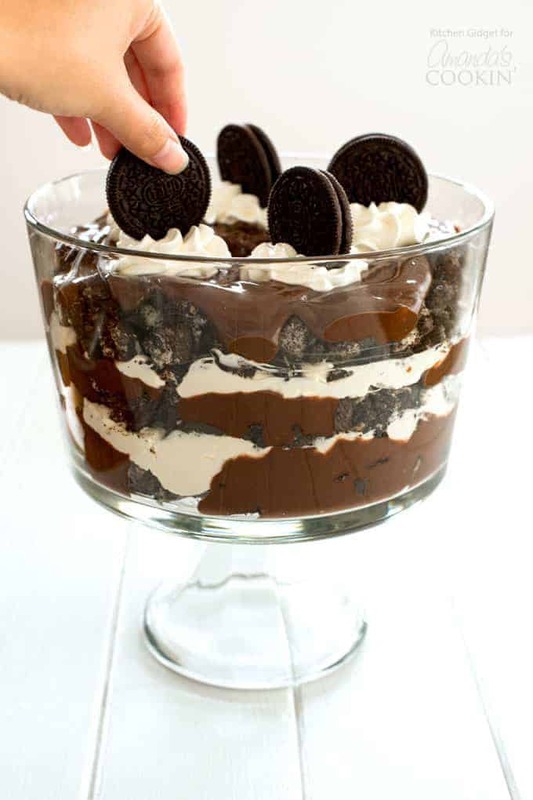 With this chocolate lasagna trifle, I’ve transformed it into an extra special dessert that doesn’t require extra effort. I love serving a showstopper for dessert that tops the main meal, even something as impressive as crispy roasted pork shoulder. This is the dessert that will have all your guests oohing and ahhing, especially as we head into the holiday season. Begin with the Oreo cookies. You will need the large package of Oreos (Family Size 19.1oz) or 48 cookies from 2 smaller packages. Save 5 for garnish later and crush the rest. You can put them in a zip-lock bag and give them a good whack (very therapeutic) or give them a quick blitz in the food processor. They should be bite-sized pieces. For the chocolate layer, whisk the pudding mix and milk together. It will thicken on its own in a few minutes. Just be sure to use instant pudding mix, not the cook & serve kind. In a stand mixer or with an electric hand mixer, beat the cream cheese until smooth. Start off with well-softened cream cheese to avoid any lumps. Slowly beat in 1/4 cup each of milk and sugar. Then stir in 2 cups of whipped topping. Now begin layering until the ingredients are used up. I love my trifle bowl because it makes the dessert look stunning, but you can also use a glass mixing bowl. To top it all off, add a mound of whipped cream in the center or pipe little dollops around the edge and top with the reserved Oreos. 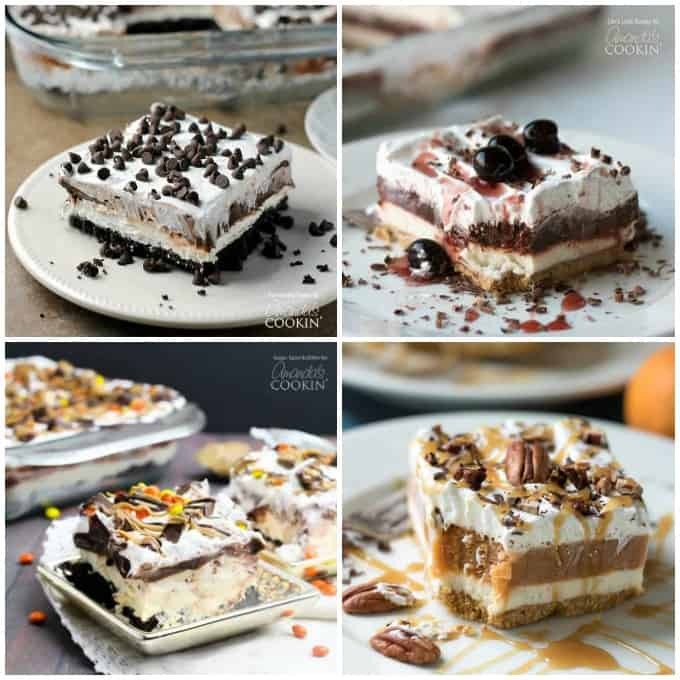 Speaking of dessert lasagna… We have plenty of recipes to share! Check them out below. Chocolate Lasagna– one of the most popular desserts on the blog! It’s a chocolate dessert no one can resist. Red Velvet Lasagna– a crunchy graham cracker crust, cream cheese layer, red chocolate pudding layer and topped with Cool Whip, chocolate shavings, and cherry syrup. Chocolate Peanut Butter Lasagna– bursting with peanut-butter-chocolate-goodness. You can never go wrong with peanut butter desserts! Pumpkin Lasagna– the perfect pumpkin flavored dessert for Thanksgiving, or just because. 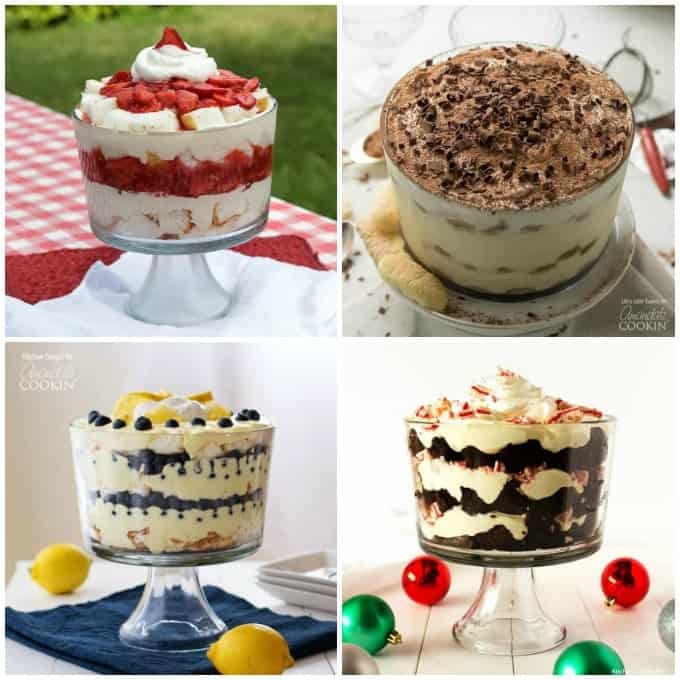 And you can’t forget about all the amazing trifle recipes! Strawberry Shortcake Trifle– macerated strawberry sauce with the addition of fresh strawberries, and a delicious whipped cream and cream cheese layer, all stacked together in a trifle bowl with sweet angel food cake. Tiramisu Trifle– a dessert at the top of many people’s favorite dessert list, this homemade tiramisu trifle will impress anyone who is lucky enough to have a taste! Lemon Blueberry Trifle– Fresh, juicy blueberries and bright, tart lemon pudding combine in a stunning dessert that will wow your guests. Chocolate Peppermint Trifle– Layers of fudgy chocolate brownies, cheesecake pudding and cool peppermint combine in this festive dessert. Perfect for the holiday season! 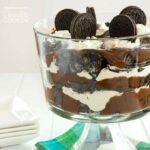 Chocolate Lasagna Trifle - everyone’s favorite dessert lasagna gets layered into a gorgeous trifle with Oreos, cream cheese and chocolate pudding. Reserve 5 Oreos for garnish and crush the remaining Oreos into bite-sized pieces; set aside. In a large bowl beat the cream cheese until smooth. Slowly add sugar and 1/4 cup of milk. Beat until creamy, then stir in 2 cups of whipped topping; set aside. Reserve remaining whipped topping for later use. In a large bowl, whisk together pudding mix and remaining 2 cups of milk for 2 minutes. 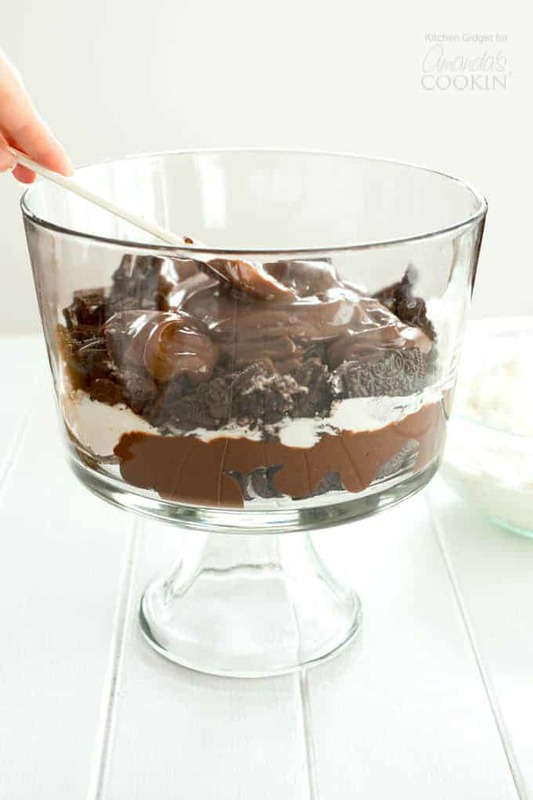 Layer 1/3 of Oreos into a 3-quart trifle bowl. Top with 1/3 of pudding followed by 1/2 of the cream cheese mixture. Finish with last 1/3 of Oreos and last 1/3 of pudding. Garnish with remaining 1 cup of whipped topping and reserved Oreo cookies. 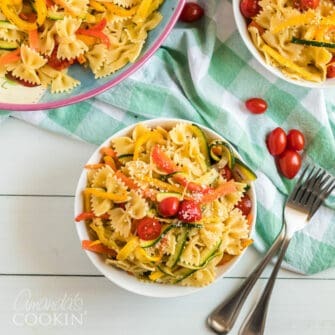 Looks so delicious and perfect for hosting!